This is the finest lure making stainless steel wire available. Torsion straightened and hardened, it springs off the coil with minimal bend. 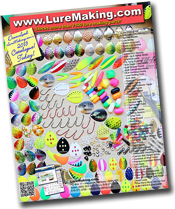 Excellent for making your own spinner shafts, leaders, spinnerbait forms and many other specialty tackle uses. Sold by the coil.